About 15 years ago now, I was introduced to a wonderful book by Vincent J. Donovan entitled Christianity Rediscovered. I have posted on this book before, and have never really gotten over reading it. I can’t remember how many copies I’ve given away. I only mention it here because I was reminded of it twice again today. First, after following some of the (mostly) ignorant commentary on Rowan Williams’ recent lecture on Civil and Religious Law in England: a Religious Perspective. (As well as the copious newspaper and blog articles, there’s also this frustrating discussion on BBC Wales with Kim Fabricius and Peter Hitchens). For a clarification of what Rowan did and did not propose see this post on What did the Archbishop actually say? We Aboriginal and Torres Strait Islander peoples believe that the Creator has always been with our people since the beginning of time. 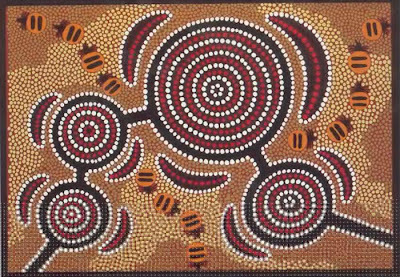 Our connection to this land Australia and the stories from long ago emphasise this and reveals to us our ongoing relationship to the Creator. We know that the Spirit is always close to us and within us. The Spirits of our ancestors are always around us looking out for us and showing us the path we should travel. We are surrounded by a cloud of witnesses. We have been given a gift to offer the rest of humanity; the importance of relationships. The Creator still has a strong relationship with us and helps us build stronger relationships with one another. These relationships also cover everything around us, for it is through the land, water and air that we are continually reminded of this. It is not just the symbol of the rainbow that reminds us about the covenant between the Creator and humanity. There are signs all around us that continually reminds us of the Covenant. Our peoples are generous, caring and compassionate towards each other and other Australians. We have survived many negative things yet we still reach out our hand in reconciliation. This is the message of long ago from our roots and also the message through the Christian Bible. It has been the message passed down from generation to generation from parent to children since time began. The Spirit lives on through us and we must continually foster this relationship through acts that remind us of this great truth. These acts are ceremonies, which help us to draw closer to our creator who has left the Spirit with us. Through them we retell and relive the great stories of our past. Since the coming of the Western Culture, there has been a breakdown in our relationship with the Creator. Our ways have been under threat and this has led us to move away from our roots and into a foreign way of thinking. This has caused hardships within our communities as we struggle to find our way. Sometimes we have failed to recognise the Spirit present with us. We looked to the new culture to show us the way forward and it has led to more confusion and loss of direction. This culture has failed our people. It has shown it cannot satisfy our deepest yearnings. This culture wanted us to look for the Creator through their eyes. They have failed to see that the Creator exists within our culture. While Abraham was wandering in the desert our peoples had been for many generations living in close relationship with our Creator. We have an Old Testament, which we can now accept as part of our salvation history. How short sighted Western Culture was to think they had the monopoly on the Creator and how blinded were we to believe this was true. It is up to us to reclaim our beliefs. Our Creator yearns for us to come back. Our relationship has been tested and made stronger because of the many mistakes along the journey because we have learnt so much from the experience. We now know about Christ. This story from the Western Culture has touched and had an impact on our lives. We did not have Jesus amongst us as the Apostles did but he left us the Spirit of the Creator with us. We know this Spirit to be the same Spirit who is with us now because of what it has done and continues to do. This Spirit of relationships reminds us about our responsibilities to one another and creation and that we all come from the same source of life. This Spirit is also the Spirit of the Rainbow Serpent, the Brolga, the Emu, the Stars, the Fish, the Plants, the mountains and much more. We must hold on to and strengthen our Spiritual heritage. As a Minority we stand as the strength of this Land. We affirm our belief in the Creator Spirit who created us. It is in our connection to this deep sense of belonging that our Identity lives. Our Culture can never be broken. We embrace our past. We are alive in the present and have hope in the future. The Creator Spirit calls us into a search for a deeper relationship with himself and each other. The Creator Spirit calls us to renewal. So the sad thing about it all was the missionaries didn’t realise that we already had something that tied in with what they’d brought to us. They saw different as inferior, and they didn’t ask us what it was that we had. And it’s very sad because if they had asked … things may have been different today. God is here in this land? Footprints left in the sand. Shadows just out of view. As we work, as we play. I hope you don’t mind that I have linked to you from this blog post. Though not a Christian, I found your post moving.